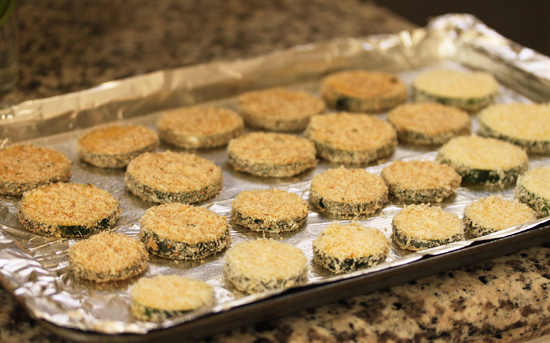 When I was thinking about what I was going to make for the August Food Bloggers L.A. meeting, which was about zucchini and tomatoes, I considered making Zucchini Fries, but ended up making the Zucchini and Tomato Tian instead. 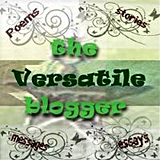 But the thought of those Zucchini Sticks at The Kettle was nagging at me and finally I decided to make some for myself. The Zucchini Sticks at The Kettle are dipped in a flour and buttermilk batter and deep fried. In appreciation of my waistline, I decided to forgo frying and do an oven-baked version instead. So I decided to do an experiment with different breading mixtures to see which one I liked the best. This is my breading station with three bowls: one with flour, one with beaten egg and one with the breadcrumb mixture. 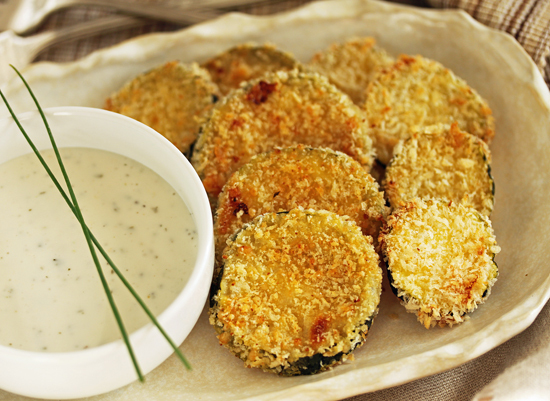 The aluminum foil covered sheet pan is lightly sprayed with cooking spray, the breaded zucchini is lined up and lightly sprayed with cooking spray. Then into the oven for a total of 20 minutes at 400 degrees and Voila! 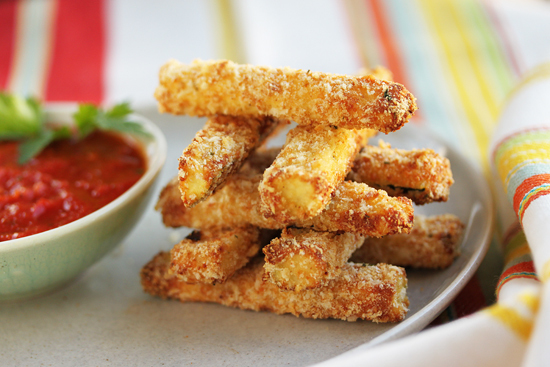 Crunchy on the outside and creamy on the inside. The Winner! Row 3: crumbs, parmesan & panko. This is what you see in the very top and very bottom photos. This version was nicely crunchy and I happily ate it with marinara. Really good. Also very good was Row 5: Panko and parmesan. It didn’t get as browned as Row 3, but it tasted so nice with the Ranch Dressing. And now I am totally zucchini-ed out. Do not mention zucchini to me again until next summer, ok? 1. Preheat the oven to 400 degrees F. Line a baking sheet with aluminum foil and spray lightly with cooking spray. 2. Place the flour in a wide shallow bowl. 3. Beat the egg in a wide shallow bowl until homogenous. 4. 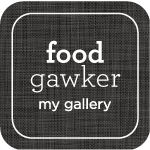 In a third wide shallow bowl combine the bread crumbs, panko and parmesan. Mix thoroughly. 5. One at a time, dredge a zucchini baton in flour. Tap it on bowl to remove all excess. 6. Dip baton in egg to coat thoroughly. 7. Roll baton around in crumb mixture to coat completely. Press each side to make sure crumbs are adhering. Scoop more crumbs up over baton and press again. 8. Place each baton on sheet pan at least ½-inch apart. Spray batons lightly with cooking spray. Bake in middle of oven for 15 minutes. 9. Remove sheet pan from oven and, with tongs, turn each baton onto another side. Return to oven and bake for an additional 5 minutes. Sprinkle with salt to taste. Sprinkle with Parmigiano Reggiano, if using. 10. 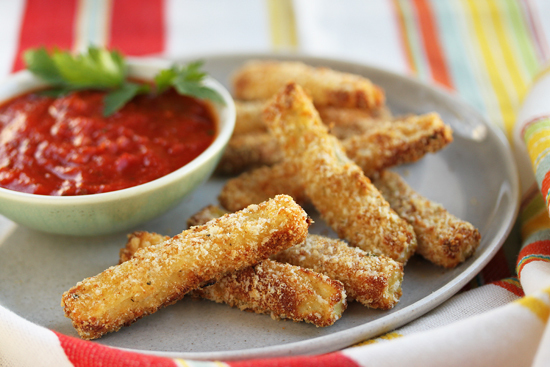 Serve with your favorite marinara sauce or dressing, for dipping. Note 1: To cook more zucchini, the recipe can be doubled or tripled. 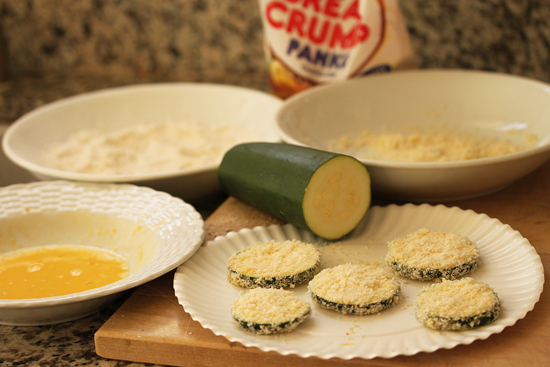 The ratio of crumbs, parmesan and Panko is 1:1:1. If you run out, just add equal amounts of each to your bowl. 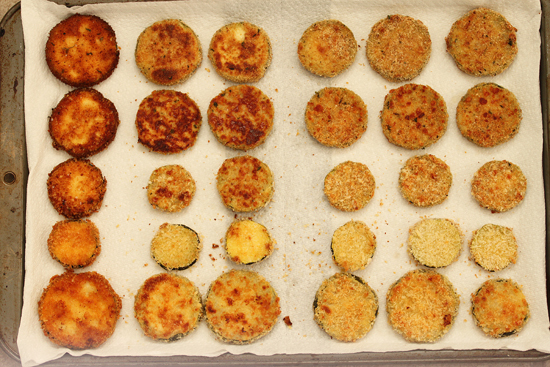 Note 2: I also liked the Panko and Parmesan mixture, which was an equal amount of each. It is cooked the same length of time, but does not get as brown. ZUCCHINI! Do you hate me now? Can I have a log cabin built out of your zucchini sticks? I would like to live there. Bravo, maestro! Well done x 5!